motor / gearbox & rollers ensure reliable operation. We are engaged in manufacturing and supplying a comprehensive range of Material Handling Equipment. Our precision engineered range comprises Belt Conveyor system(Coal handling, Slider bed, etc), Chain Conveyor system(Drag Chain Conveyor, Redler Chain conveyor, en-masse, etc.) 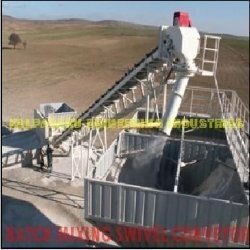 , Ash Handling System(Wet Scrappers, Pneumatic Conveyors, Ash Conditioners, etc. ), Screw conveyor System, Agitator mixers and Shuttle Conveyors. In addition to these, we also offer Forged Chain, Conveyor Idler & Bracket, Industrial Centrifugal Fans & Blowers Conveyor Pulley and Rotary Air Lock. Further, we are also capable of undertaking erection and commissioning at customer’s site. The range manufactured by us is made using quality components and is customized as per the varied specifications provided by the clients. We have installed various latest technology machines at our manufacturing unit to fabricate products as per the set industry standards.